Welcome to the July update of the Developer Preview. With this release, we bring you several new features that help building your solutions as extensions. We also include over 90 resolved GitHub issues. See the list of closed bugs here: https://github.com/Microsoft/AL/milestone/18?closed=1. This Developer Preview is available only through the Ready to Go program. Read more at http://aka.ms/readytogo. To get all fixes and features described in this post please make sure you are running an image with a build number 13.0.32492.0 or newer. It is now possible to declare OData bound actions in AL. A new attribute [ServiceEnabled] and new AL types WebServiceActionContext and WebServiceActionResultCode have been introduced to achieve this. Note that similarly to C/AL approach the function’s parameter has to be named ‘actionContext’ to be correctly picked up by the OData framework. Press the Start button in order to start recording events. Now, perform the actions required for your scenario. Press the Stop button to get the list of all recorded events. Choose the event that suits you the best and get an AL snippet to use in VS Code by choosing Get AL Snippet. In this Developer Preview, we’re also adding the ability to add and extend enums. This section introduces the concept. Enums require an ID and a name. In the preview the IDs are not validated against any license, but they must be within your assigned object range. An enum contains a list of values. The value corresponds to the individual elements of the OptionString on an Option. The value has an ID and a name. The ID is ordinal value used when persisting the enum and hence they must be unique. The name is used for programmatic access and is a fallback for the caption. Enums are pure metadata and can’t contain any kind of code. Since most of the enums that are currently relevant for extensibility are on table fields in the base-app, we have made it possible to mark a table field in C/SIDE as Extensible. 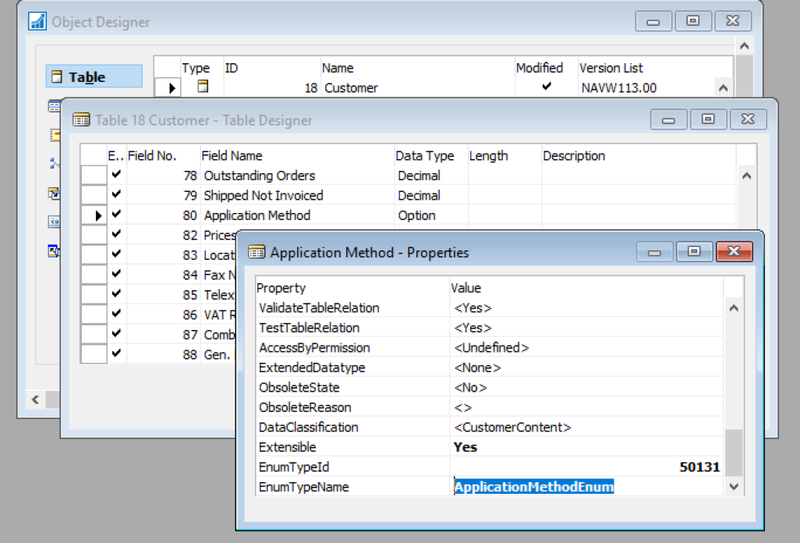 To extend a table field option you must set up your development environment to run C/SIDE and AL side-by-side as described here: https://docs.microsoft.com/en-us/dynamics-nav/developer/devenv-running-cside-and-al-side-by-side. Once the feature is out of preview we will allow requesting base application enums to be made extensible through GitHub requests similar to event requests. Conversions to/from Enums are more strict than for Options. To be backwards compatible we support conversion to/from any Option, but we may in the future be more strict. No runtime checks for ID collisions. Declare C/SIDE enums with the same ID on multiple table option fields will break symbol generation.